1.2 How do I start the Biological Cycle? 1.3 How do I know when the Biological Cycle is complete? 1.4 Where does Ammonia come from? 1.5 When can I add new fish to my Aquarium? You must exercise patience when setting up a new freshwater tropical aquarium. It takes time for nature’s biological process to begin working in your aquarium… usually a minimum of 4 to 6 weeks. The biological cycle depends on beneficial bacteria to break down toxic organic compounds into less toxic compounds. We can then safely manage these less toxic compounds through weekly water changes. The beneficial bacteria that we need to culture in the aquarium is called Nitrosomonas and Nitrobacter bacteria. Nitrosomonas bacteria breaks down deadly ammonia to less toxic nitrite. Nitrobacter bacteria then converts nitrite to an even less toxic nitrate. You can’t see these toxic chemicals in the aquarium, they can only be detected with test kits. Sometimes algae blooms are an indication of excessive nitrates. How do I start the Biological Cycle? The biological cycle can be started by adding 2 or 3 very hardy fish to your new aquarium. The hardy fish that you introduce to your tank have small amounts of the bacteria in their digestive tract which will get released into the aquarium. Both Nitrosomonas and Nitrobacter bacteria live in the substrate of your tank. They depend on oxygen to live. That’s why it’s important to keep your powerheads or air pumps working at all times. They pull air from the water thru the gravel giving the bacteria a continuous supply of oxygen. Some say not to do it… but you can speed up the biological process by adding gravel from an established tank into the new freshwater tropical aquarium. I’ve done this several times with no problems. The bacteria will spread from the old cultured gravel to the new gravel. 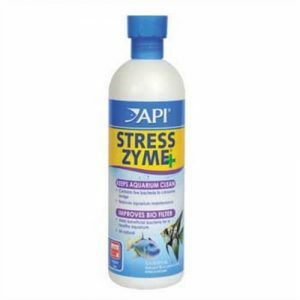 Another proven method of speeding up the biological cycle is by adding Stress Zyme to the aquarium water when you introduce your first fish. Stress Zyme contains over 300 million beneficial bacteria per teaspoon. How do I know when the Biological Cycle is complete? Testing, testing, and more testing. You’ll need to buy a water test kit that tests for Ammonia, Nitrite, and Nitrate. The first thing that will happen in a new aquarium is that you’ll see a spike in Ammonia levels a few days after you’ve added your 2 or 3 hardy fish. Keep testing the water every couple of days and eventually, you’ll see the Ammonia level drop and the Nitrite level will spike. This is a good indication that the biological process is beginning to start. Continue testing every couple of days and eventually you’ll see the Nitrite level drop and the Nitrate level will spike. Nitrate is easily managed by changing 10% to 20% of your aquarium water on a weekly basis. Keep track of water conditions. When can I add new fish to my Aquarium? Usually after 6 to 8 weeks its safe to add 2 or 3 more new fish to the tank. Wait a couple of weeks then add another 2 or 3 new fish again. In the meantime keep testing your water. Wait 2 weeks and then add a couple more fish until you reach the population density that your tank can safely handle.